COLLECTION includes spinning wheels, looms and artifacts. A visit to Suzie Henzie’s Citrus Ave. home feels like a trip to a museum. There, a three-story addition houses Henzie’s massive textile collection that includes 50 spinning wheels, more than 60 looms and hundreds of other fiber-related artifacts from around the world. Henzie, a well-known collector and authority on textile arts equipment who has been collecting for many years, recently agreed to donate her entire collection to the Antique Gas and Steam Engine Museum in Vista. Gracious and delightful, Henzie’s enthusiasm for the art and the mostly wooden wheels and looms was contagious as she led me through her vast collection. “I’m a wood person, I just love the wood,” she says as she touches piece after piece in her collection while reminiscing where each one came from. 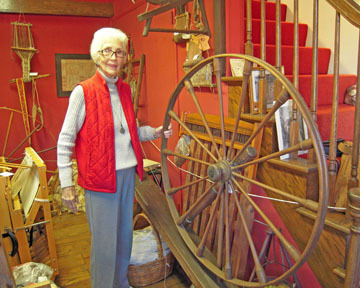 Weaving since she was six-years-old and spinning since she was 10, “I inherited my family’s 200-year-old spinning wheel from Virginia, and that’s how it all started,” said Henzie. Weaving classes at L.A. City College further ignited her passion, and she’s been at it ever since, serving on the first board of directors for the Handweavers Guild of America, and still active in the Southern California Handweavers Guild and Textile Group of Los Angeles. She’s also written a book on fiber preparation and many articles for various fiber magazines, and has taught classes at USC. MINIATURES are included in her collection. 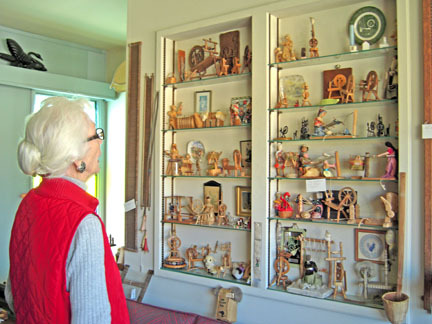 Henzie’s husband, George, who passed away six years ago, was an accomplice to her collecting; it was his idea to build the three-story addition to house her equipment and artifacts. “He found a rare loom, and he wanted to surprise me with it, so he went to hide it in the attic. But when he got up there, he found I already had three of them,” she recalls with a smile. “I buy anything I find with a hole that I can put thread in,” she added. But now she feels it’s time to pass her collection—”her babies”—on to the public. “It’s been a nice life, but I’m not getting any younger,” and her two grown children want no part of it. “The house is full, and my sons think I’m nuts,” she laughs. She offered her collection to museums around the country, but they all wanted to break it up. Finally, the Antique Gas and Steam Engine Museum agreed to take the entire collection. “They have no idea what all I have here,” Henzie says as we move from a wall of cabinets filled with spindles and fabrics and all kinds of fiber tools, to a collection of 100 miniatures. On the way to the third floor, which houses the spinning wheels, she shows me a huge closet filled with beautiful gowns—which will also be donated—created from fabric she spun. One wonders how Henzie will be able to part with her “babies.” But with the museum’s new building still in the planning stages, it’ll be some time before she has to say goodbye.